Students and community members make their way to the polling site in Reynold's Club. Through canvassing trips, phone banks, and speaker events, UC Democrats and College Republicans have campaigned relentlessly for the slate of local and statewide candidates running in the midterm elections. 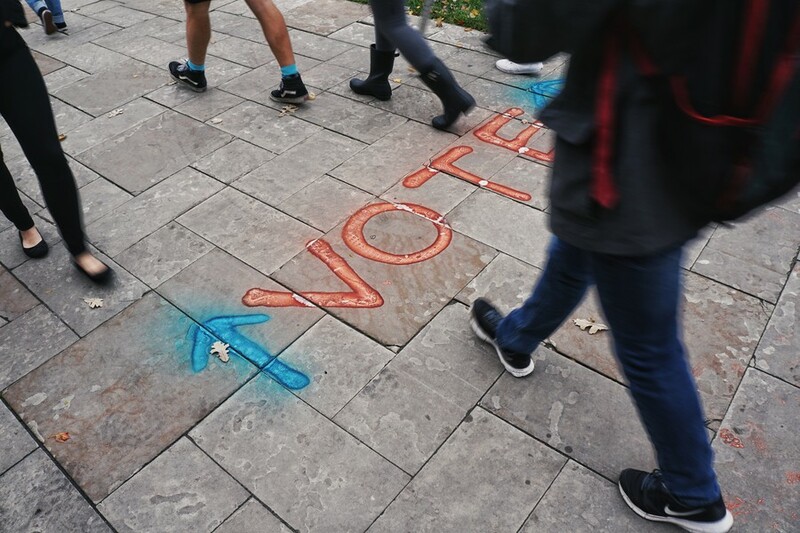 The groups’ time-intensive engagement with the local elections point to what many UChicago students see is at stake in the midterms. Several incumbent Republicans from Chicago’s suburban districts are fighting for contested seats this year in a reflection of other races throughout the country. Polls show that Democratic challengers have turned Chicago’s once-solid Republican suburbs into tossups or Democratic-leaning districts. The groups have been working with local candidates amid unprecedented campus-wide enthusiasm for the midterm elections. As of October 31, UChicago was leading the country with the largest percentage of undergraduates registered to vote on TurboVote. This mirrors a nationwide uptick in early voting. As of Monday night, 36 million people have cast their ballots already, nearly 10 million more than the early turnout in the 2014 midterm elections. “2016, because, obviously, there wasn’t enough focus on the Midwest in the presidential election,” he explained. UC Dems kicked off its campaigning in August with a nationwide convention for college Democrats. Among the invitees were J. B. Pritzker, the Democratic gubernatorial candidate, and Hadiya Afzal, a 19-year-old student at DePaul University running for a county board seat in DuPage County, which is west of Chicago. Knapp and another UC Dems member are also managing Afzal’s campaign. Since the school year began, members of UC Dems have traveled extensively—often commuting for hours on the Metra—to canvass in congressional districts that were likely to turn blue. Students traveled to Geneva and Batavia in the outer Chicago suburbs to canvass for Lauren Underwood, the Democratic candidate for Illinois’s 14th District. Last weekend, UC Dems visited another swing district, Illinois’s Sixth District, to canvass for Democratic candidate Sean Casten. While the governor’s race is also heated this year, the UC Dems have not campaigned as actively for J. B. Pritzker. “There are, of course, a lot of people working on the governor’s race,” Knapp said, “but if College Dems see…a place where we ourselves can make a difference, [it’s] going to be in the down-ballot races.” Down-ballot races are less high-profile races whose candidates may not be as familiar to voters as candidates for governor are. On the other side of the aisle, members of College Republicans have also campaigned hard for their respective candidates with biweekly phone banks and weekend canvassing trips. Fourth-year Brett Barbin, president of College Republicans, said, “These are for [Governor] Rauner, primarily. We really want to see Rauner win in November.” The group has also visited Illinois’s Sixth District, the district visited by UC Dems last weekend, to campaign for Republican incumbent Peter Roskam. Inviting candidates to campus to speak to students has been a larger part of the College Republicans strategy. In October, College Republicans hosted an Illinois College Republicans Convention. Throughout the day, students from across Chicago heard from Republican candidates including Jim Dodge, who is running against incumbent Illinois Treasurer Mike Frerichs. They have also hosted speakers throughout the quarter. Institute of Politics fellow Tom Davis, the former chair of the National Republican Congressional Committee, sat down with students at a College Republicans meeting last week. Several other candidates running locally have also made appearances at College Republicans meetings, including Jimmy Lee Tillman, a candidate for Illinois’s First District, which covers most of Hyde Park, Kenwood, and large areas of the South Side.